I use the graph as a treasure map. In the equation y=mx + b, I tell students to ALWAYS color the y axis yellow. 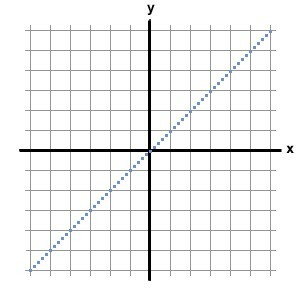 For students that learn better visually, this differenciates the two axis lines. They grow accustomed to the yellow vertical line being the y axis. In the equation, I tell them that the b stands for the b in BOAT. I also tell them the pirates love banana boats because they are yellow and remind them where to park the boat (on the y or yellow axis line). 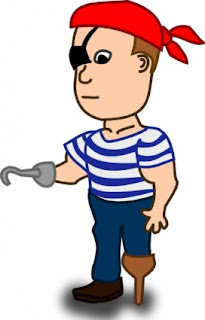 Always look to the number in the b spot in the equation-- as that is where the pirates will park their boat. It is also the very first dot to mark on the graph. For example, if the equation is y= 2/3x + 8, the pirates go up from the (0,0) mark by 8 spaces and mark that with a dot. Or...park their boat there. I then tell them to look next at the number or fraction (m) in front of the x. The numerator tells them how many steps (or spaces) to go north. The denominator tells them how many spaces to go east. They mark the new spot with a dot, then draw a line between the two dots. The treasure is hidden along this line. If the m equals a whole number, simply place a 1 in the denominator to turn it into a fraction. I have had great success with this story. It turns algebra into a fun activity and takes the fear away from those who can't grasp graphing. I might even have candy treasures for them to find when they corectly graph an equation.